momscrazyday: Phineas and Ferb Movie Party! 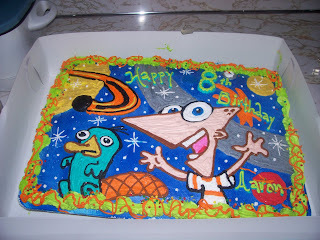 These are some pictures from the awesome Phineas and Ferb party we were so lucky to have hosted, last Friday night through Childs Play Party!! The kids had an amazingly fun time! Disney provided us with party favors, sling bags, tattoo sheets, stickers, pins, and masks! We served, Subway sub platters, birthday cake, Cheetos, fruit trays, and veggies and dip! We had 16 kids total, and between those 16 kids and 9 foot long Subway subs, (Subway did a super job turning this into a plater for us!! ), they ate them all! Even the fruit went quickly!! As you can see from some of our party pictures, the girls seemed to be the most interested and more giggly out of the bunch! As well as my oldest daughter, Bethany, and her friends lol! This was a very cute movie. I did get a chance to watch the majority of this the next day since it was tivoed! Everybody seemed to have a fun time watching this movie, and rehearsing each line after it was over! 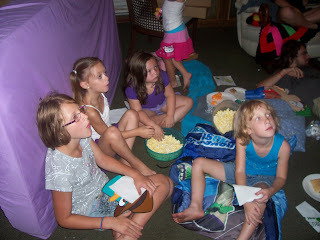 Suprisingly, the girls who attended, were much more interested in this movie then the boys seemed to be. Which made me wonder why Disney seems to focus more on the boys for this cartoon. I believe the sisters on the show are very true to life, and a lot of us can relate to them! They made the girls giggle and laugh like crazy, not to mention gave them some ideas on how to handle brothers! 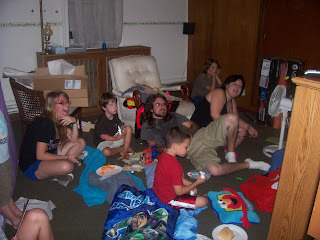 I've met little boys, including my own son, who really like to watch The Powerpuff Girls! They will tell you it's because they like Mojo Jojo, but I've seen the smiles they give the naughty one, Buttercup. I really enjoyed this movie, and so did our guests. i am happy to know that such a cool cartoon, is out there for our children. My son especially is happy to hear about upcoming video games and novels. We need characters like Phineas and Ferb, and Perry and Candace, in this day and age. I'm relieved to know that my children can watch such a show, without me having to wonder what they're going to learn, what don't I want them to see, hear, and do I have to watch every episode before I allow them to watch. I can safely trust Disney, and their channels, to take care of this. I am very thankful they add such a very cool twist to this cartoon so that boys in this age group keep coming back for more! A child's party group is a cool idea! And that cake looked awesome! I love the pictures of everyone having such a good time. I know it is hard to get families and friends together for things any more but it is worth the effort when it happens. I love the beautiful cake too.